I had a friend over last week who wanted to stamp/cut butterflies. This stamp was still out on my workspace. I had to stamp my own butterfly! Supplies: Stamps – Papertrey Ink, Stampin’ Up!, paper – Neenah Classic Crest Solar White, Poptone Sour Apple, Stampin’ Up! Pacific Point, ink – VersaFine Onyx Black, embossing powders – Filigree Fine Art Powder clear, Ranger Liquid Platinum. 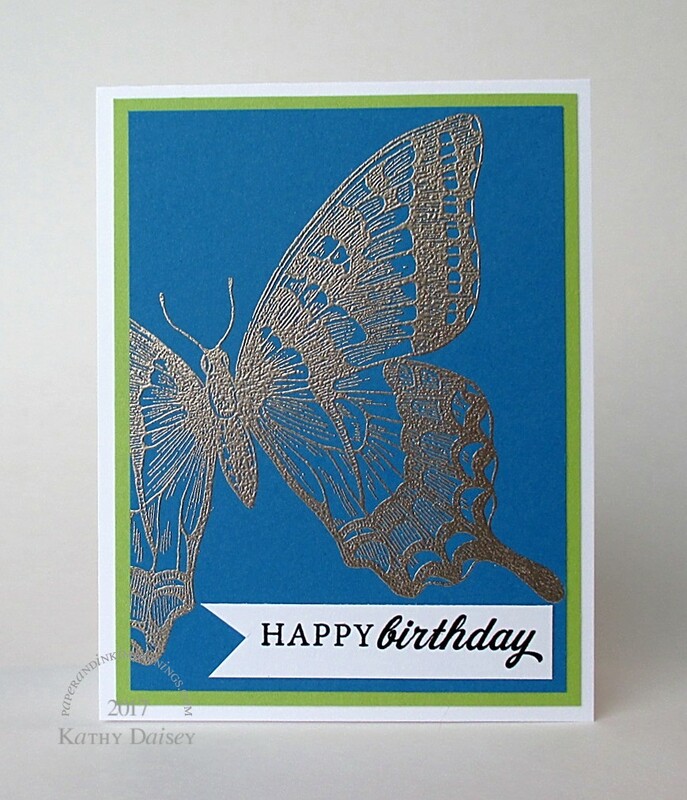 Categories: birthday, card | Tags: card, Neenah, Papertrey Ink, Poptone, Ranger, Stampin' Up!, Tsukineko, VersaFine | Permalink. Love that stamp! It has such impact that not much else is needed, right? I have a question though, coming from the colour schemes you have been using recently. Do you store your card by colour or by manufacturer? I agree, Gillian, the butterfly is all that is necessary (plus, it is so big, you can’t squeeze much else on! 😉 ). Card stock storage – I currently have most of them stored by manufacturer. (exception to rule – if I bought a “sampler pack” – I just got one of shimmery white family, different manufacturers. That is staying together.) And I know that sounds DAUNTING, but I really don’t have that many manufacturers, do I ? The Sour Apple was a bargain – 50 sheets for $7. The Royal was NOT on sale! Lol, no, I was just wondering because you put the shades together so well. I guess this means you have a very good memory for what is in your stash! Oh, again, thank you for the compliment, Gillian! Most of my colors are Stampin’ Up! (I am a long time customer, was even a demonstrator (for the discount!) for 5 or 6 years). I am just branching out some now – trying different products in colors that I love. Trying to figure out which online stamp companies use which paper lines. Ah. I have been tempted by Stampin’ Up many times. Not sure I can hold out much longer! Stampin’ Up! was where I discovered stamping in 2002. It was a great way to start. There are so many more products available now – I don’t know if I would have figured it all out with so many different choices. Personally I think you have it more figured out than most people do! Oh, you are kind! I am very spatially oriented (Math brain), and I have a good eye for color (not sure where that came from? ).